We are software developers for web sites, apps, databases & system integrations. We specialise in PHP/MySQL and WordPress, Microsoft's .Net for web, mobile, desktop and DotNetNuke CMS. We build websites for traditional browsers and mobile devices & integrate your CRM & accounting systems. When it comes to choosing which CMS software to use for powering your new website there is a lot of choice; what you choose will depend on exactly what you intend to use your website for and perhaps your budget. It’s difficult to know which content management system (CMS) platform is the best for you, so we’re covering the four most popular website building software platforms to help you navigate through what can sometimes seem like techy overload. 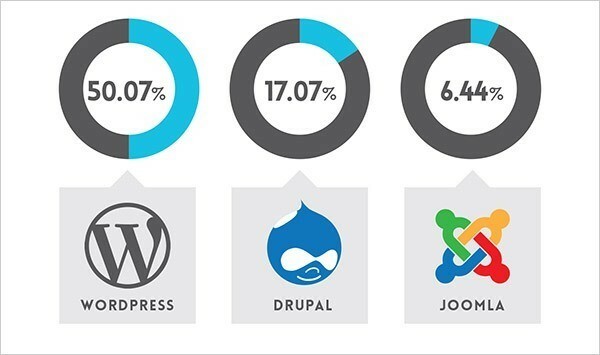 When we started out our research WordPress, Joomla and Drupal were the three website builder platforms we found most information about and most popular to use, but speaking to more people ‘Concrete5’ started to creep in occasionally, so we have also included Concrete5 in our table below to offer a comparison of Concrete5 vs our top three CMS platforms. Each of the three main CMS software choices for website design immediately below are open source CMS which means they are free to use – albeit you can also enhance their capability with premium bought plug-ins and themes. Each has a strong community, so there is always someone online to help with any questions that you may need answering on their associated forums. As a simple CMS comparison, how do each three top website CMS platforms compare in the popularity stakes? Ease of Use Technical experience is not necessary; it’s intuitive and easy to get a simple site set up quickly. It’s easy to paste text from a Microsoft Word document into a WordPress site, but not into Joomla and Drupal sites. Drupal requires the most technical expertise of the three CMSs. However, it also is capable of producing the most advanced sites. With each release, it is becoming easier to use. If you’re unable to commit to learning the software or can’t hire someone who knows it, it may not be the best choice. Less complex than Drupal, more complex than WordPress. Relatively uncomplicated installation and setup. With a relatively small investment of effort into understanding Joomla’s structure and terminology, you have the ability to create fairly complex sites. Requires some learning and expertise, but fairly intuitive for experienced web builders. Basic site set up is fairly easy with basic building knowledge. Platform is moving towards ease of interface and use and WordPress.org / .com like options soon. Features Ease of use is a key benefit for experts and novices alike. It’s powerful enough for web developers or designers to efficiently build sites for clients; then, with minimal instruction, clients can take over the site management. Known for an extensive selection of themes. Very user-friendly with great support and tutorials, making it great for non-technical users to quickly deploy fairly simple sites. Known for its powerful taxonomy and ability to tag, categorize and organize complex content. Designed to perform as a community platform, with strong social networking features. Supports backend projects such as document management and project tracking. An over-ride system allows ease of core site functionality modification, plus add-ons available so no need for hacking core code. Fewer themes than the ‘Big 3’ due to newness of platform. Otherwise ‘virtually unlimited’ for the experienced builder. Text editing easy. Best Use Cases Ideal for fairly simple web sites, such as everyday blogging and news sites; and anyone looking for an easy-to-manage site. Add-ons make it easy to expand the functionality of the site. Some highly sophisticated WP sites out there too. For complex, advanced and versatile sites e.g. sites requiring complex data organization, or community platform sites with multiple users. Good for online stores requiring inventory management info. Joomla allows you to build a site with more content and structure flexibility than WordPress offers, but still with fairly easy, intuitive usage. Supports E-commerce, social networking and more. Flexible enough to handle lots of content fairly easily. High end users such as the Swiss Government use this platform. ECommerce Good choice for creating high-end business websites Good choice for creating high-end business websites, except Ecommerce plug-ins are still premium until forthcoming upgrades. Our thanks to Trust Radius for their help with our review of Concrete5 and to Rackspace for the others. If you have been checking out CMS comparison sites and are feeling a little overwhelmed, need to talk through your options, or you have any questions about which CMS to use or are looking to migrate from one CMS Platform to another then do get in touch with Team Performance Web. We have lots of experience in-house with using a variety of CMS Software, both off the shelf and bespoke. Are your clients missing out on web driven business? KLOC Digital Solutions (formerly Performance Web) are a web and software development business based in Hungerford, Berkshire. They undertake a wide range of projects from bespoke web and mobile builds to large-scale development projects. Over the last 10 years KLOC have delivered 500+ projects with customers ranging from small, ambitious start-ups, through to established SME’s and large multi-national companies.